The new for 2019 PNSO Atopodentatus model. Pachypleurosauria* – PNSO have also introduced a pachypleurosaur into their “Prehistoric Animal Toys That Accompany Your Growth” range, one of the twenty-four new models is “Ricky” the Keichousaurus. The fossil material associated with this genus comes from south-western China (Guanling Formation). The strata are thought to be Middle Triassic in age (Anisian faunal stage) and these marine deposits have helped scientists to construct a picture of how life bounced back from the devastating End Permian extinction event. When first described, Atopodentatus was thought to feed by stirring up mud on the seabed to filter out small invertebrates. The rostrum was thought to be downturned, resulting in this reptile having a vertical, zipper-like jaw. Strange Triassic marine reptile. Atopodentatus unicus was thought to have had a downturned rostrum, a unique jaw configuration not found in other vertebrates. Turns out, Atopodentatus did not have such a unique and highly specialised feeding adaptation after all, but it is nonetheless, quite remarkable. Additional specimens led to a new interpretation of the shape of the skull and rather than having a downturned rostrum, Atopodentatus had a set of jaws shaped like a hammerhead. It was proposed that Atopodentatus was herbivorous. The teeth lining the hammerhead were used to scrape seaweed and algae from rocks. The plant material was then sucked into the back of the mouth and filtered by the long, thin tooth mesh. An illustration Atopodentatus feeding underwater. Atopodentatus unicus still had a highly specialised feeding adaptation, although one not quite a peculiar as previously thought. It still represents the oldest record of herbivory within marine reptiles and its discovery has helped scientists to better understand how marine ecosystems recovered after the End Permian extinction event. The PNSO Atopodentatus unicus model. Everything Dinosaur’s first newsletter of the spring features the first of the new for 2019 CollectA figures and a special offer on an extremely rare Bullyland flying reptile figure. The latest figures in the CollectA “Age of Dinosaurs” series have arrived and it is great to see the Deluxe Caiuajara with its movable jaw, the Borealopelta, Edaphosaurus and the box of mini prehistoric animal models in stock. Top billing in the newsletter is given to the remarkable CollectA Deluxe Carnotaurus – we know how keen dinosaur fans and model collectors have been on this model since we announced that it was going into production, back in November (2018). Top billing in the latest Everything Dinosaur newsletter. Ever since the 1:20 scale CollectA Dimetrodon was introduced in 2018, fans of this range have been eagerly looking forward to the addition of another Permian pelycosaur to this series. The hand-painted 1:20 scale CollectA Edaphosaurus lives up to all the hyperbole and it makes a great accompaniment to the Dimetrodon figure. The new CollectA Edaphosaurus model features in an Everything Dinosaur newsletter. Everything Dinosaur has also received a shipment of Caiuajara models, complete with an articulated lower jaw. Fossil of this pterosaur were found in Brazil. The CollectA Borealopelta figure has also arrived, although sadly, several cases of models were lost during shipment. A spokesperson from Everything Dinosaur commented that plans were in place to get more of these armoured dinosaur models into stock as quickly as possible. Perhaps, the missing models have got lost in a mine, as the only known Borealopelta specimen was discovered in a mine located in north-eastern Alberta (Canada). CollectA Deluxe Caiuajara and the CollectA Borealopelta figure. Also just arrived at Everything Dinosaur is the box of mini prehistoric animal models. A set of twelve miniature figures produced by CollectA and designed to accompany their larger equivalents in the scale model series. Last but not least, the March newsletter features a special offer! A chance to purchase the very rare and long retired Bullyland Pteranodon sternbergi figure at the same price offered by Everything Dinosaur when it was last available nearly ten years ago! The new set of twelve mini prehistoric animal models from CollectA and a special offer on the very rare Bullyland Pteranodon sternbergi figure. Everything Dinosaur newsletter subscribers are amongst the first to learn about new models and replicas coming into stock. Subscribers can also be the first to join a priority reserve list to ensure that they can acquire new figures. Our newsletter is sent out periodically and it is free to join. The extinct clade Creodonta, a term first used by the famous American palaeontologist Edward Drinker Cope (1875), was composed of a great variety of carnivorous mammals, of all shapes and sizes. One of the most imposing of these predatory mammals was Hyaenodon gigas. With a shoulder height of around 1.4 metres H. gigas was one of the largest members of the Hyaenodontidae family. For a comparison, male Bengal tigers (Panthera tigris tigris), stand around 1 metre high at the shoulder. A fully grown H. gigas is estimated to have weighed around half a tonne. This was a very formidable carnivore. Those clever people at Safari Ltd have created a stunning image that highlights the beauty and detail of their Wild Safari Prehistoric World Hyaenodon model. The Hyaenodon gigas replica part of the Wild Safari Prehistoric World model series by Safari Ltd.
Last year, Safari Ltd introduced several new synapsid models. For instance, a Przewalski’s horse was added to their “Winner’s Enclosure” collection. Numerous prehistoric mammals as well as a stunning Dimetrodon replica were also launched. In 2018, Safari Ltd added the Hyaenodon gigas, Uintatherium, Megacerops, Macrauchenia, a Daeodon and a model of an American Mastodon (Mammut americanum). Some wonderful synapsid models were introduced in 2018. From top left Przewalski’s horse (extant) with the extinct pelycosaur Dimetrodon (below). From left to right – Uintatherium, Megacerops, the American Mastodon, H. gigas, Macrauchenia and a trotting Daeodon model. Naturally, each of these prehistoric animal figures is supplied with its very own fact sheet, so collectors and model fans can learn about the creature that the model represents. Our congratulations to Safari Ltd for making such a diverse range of figures and for producing such stunning images to accompany their model range. The use of light and the clever photoshop effect of movement of the water in the puddle adds a new level of authenticity to their figures. The reflection of the Hyaenodon model has been skilfully created and we look forward to posting up more examples of this sort of creativity on our blog in the near future. Reflecting on the Wild Safari Prehistoric World Hyaenodon gigas figure. The first of the new for 2019 prehistoric animal models from CollectA have arrived at Everything Dinosaur. The armoured dinosaur Borealopelta, the pterosaur Caiuajara, the deluxe Carnotaurus and the Edaphosaurus models are now all in stock. In addition, the set of mini prehistoric animal models has also arrived at our warehouse. The CollectA box of mini prehistoric animal models which is available in 2019. Twelve prehistoric animal models in the box set. 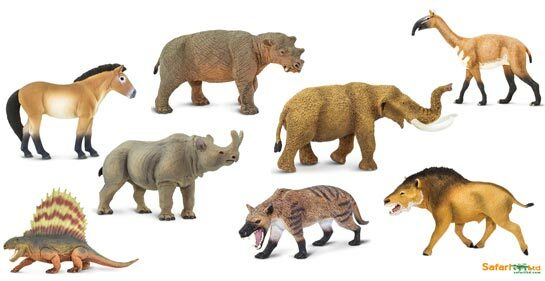 Joining the CollectA mini sets of prehistoric animals series is this new box of mini prehistoric animals, twelve miniature replicas of larger figures within the CollectA range. The models in the box include Megacerops, Daeodon, Paraceratherium, Smilodon, Arsinoitherium, Uintatherium, Andrewsarchus, Moropus, Deinotherium and a Woolly Mammoth. All these are mammals from the Cenozoic, but interestingly the box set features a replica of the giant prehistoric bird Kelenken and the bizarre therapsid Estemmenosuchus – “crowned crocodile”. Estemmenosuchus lived during the Permian, many millions of years before the other creatures featured in the box set evolved. One of the first of the new models to be announced, back in early November, was the Borealopelta, a model of an armoured dinosaur that was formally named and described in 2017 (Brown et al). The CollectA Age of Dinosaurs Borealopelta dinosaur model. CollectA have recently rebranded their prehistoric animal range and called it the “Age of Dinosaurs”. One of the largest models introduced is that of the Brazilian pterosaur Caiuajara (C. dobruskii), it measures 23 centimetres long and that spectacular crest stands around 22 centimetres high. It is a fantastic model of a flying reptile. The Caiuajara model has an articulated lower jaw and it is great to see a replica of a pterosaur added to the CollectA model range. The CollectA Deluxe Caiuajara pterosaur model. Dinosaur fans had been asking CollectA to produce a large, deluxe version of Carnotaurus to accompany their growing range of different types of Theropod dinosaur included in the deluxe model range. The CollectA Carnotaurus is spectacular and it has already attracted a number of positive comments on Everything Dinosaur’s Facebook page. The Edaphosaurus figure has also been eagerly anticipated. CollectA made a commitment some time ago to include more animals from the Palaeozoic in their model range. The CollectA Edaphosaurus is the latest example of this policy. The CollectA Edaphosaurus and the CollectA Carnotaurus models. The CollectA Deluxe Carnotaurus (top) and the CollectA Edaphosaurus (bottom). Bring Back the Original Papo Green Standing T. rex? In one of our recent discussions with the management team at Papo, Everything Dinosaur team members were asked to provide feedback on the introduction for 2019 of the Papo brown running T. rex dinosaur model. Tyrannosaurs have been a staple of the Papo range ever since their first Tyrannosaurus rex, the famous green standing T. rex figure was introduced. Sales of the brown running Tyrannosaurus rex continue to be strong, but this got us thinking, what if Papo was to produce a limited production run of their original T. rex model? The last of its kind, the Papo green standing T. rex dinosaur model. The original Papo T. rex was officially retired after the 2011 production run, however, Everything Dinosaur was able to use its influence to acquire the very last stocks of this dinosaur replica, but these very soon sold out. With its articulated lower jaw and peg-like, blunt teeth, this award winning dinosaur model had been very popular with young dinosaur fans and model collectors. It was replaced by the brown colour variant with a new head sculpt in May 2012, but Everything Dinosaur still receives periodic requests from model fans eager to get hold of this dinosaur figure. Since then, the Papo range of prehistoric animal replicas has expanded considerably, but as the Papo imagery associated with their first “tyrant lizard king” seems to be out of copyright, young dinosaur fans have been increasingly exposed to images of this figure, but unable to obtain it. The question is whether with the introduction of a brown running T. rex figure, should Papo bring back the original green standing T. rex? The Papo Green Standing T. rex Dinosaur Model – Long Extinct but Should it Come Back? The Papo green standing T. rex dinosaur model. Should we start a campaign to re-introduce this long extinct figure? Should Papo bring back for a limited time their original green standing Tyrannosaurus rex?